The ninja was, without a doubt, the most badass character to grace pop culture back in the 80s and 90s. They were portrayed in many different forms, whether that be toys, TV shows, movies or, of course, video games. The Shinobi and Ninja Gaiden series stood as the more popular of their kind within the arcade and home console market. 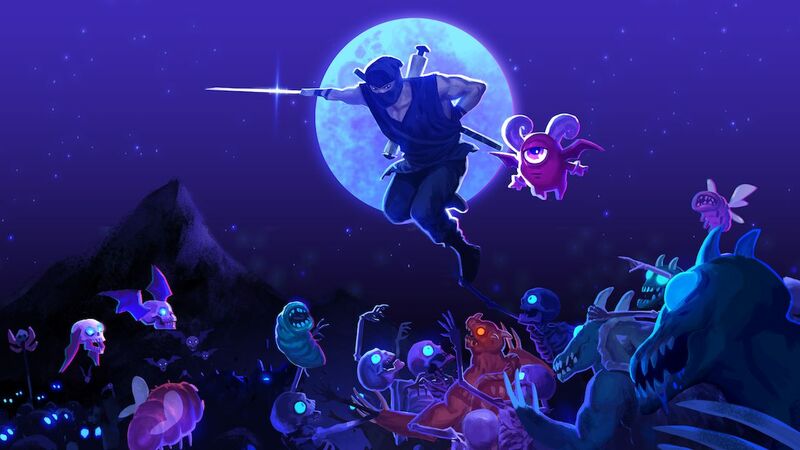 While these familiar retro franchises clearly set an inspiration for this action-platforming adventure, very few titles even in this day and age have managed to capture the magic, charm and surprises that The Messenger has to offer. It’s rare for a reviewer to urge the reader to simply skip to the final verdict. At any rate, if you know nothing at all about The Messenger, I would highly recommend to just read the blurb on the Nintendo eShop and jump into it blindly feet first. While I aim to do my best to keep things completely spoiler free, do understand that I may vaguely touch on some of the surprises that await you. Still here? Ok then, I take it that you have probably already seen the trailer, so you may have a brief idea of what to expect. However, don’t go in predicting a game that takes a clever gimmick and beats it into the ground. In fact, developer Sabotage is clearly confident enough to make a point of this by proving that there is much more to offer than a sweet, toffee-coated visual time skip. Where the magic lies is in how the whole package feels like the core release, its sequel and a director’s cut working in unison with each other at a drummer’s beat. Your own abilities grow with the main protagonist as he ventures forth to deliver a scroll handed to him by the legendary “Western Hero.” The concept of simply carrying an important message from one place to the other is all that the game really needs to send you off on your way. However, what completely took me off guard was how brilliantly the story’s narrative fleshes out the soul of the adventure. Not necessarily just in a deep and meaningful way as you would expect from something loosely inspired by feudal Japanese lore, but something far wittier and hilariously executed. The Messenger has no qualms in breaking the fourth wall within its context. The banter between the sole protagonist and the mysterious shopkeeper is full to the brim of comedic charm that had me digging for dialogue routes in an effort not to miss another well-timed punchline. What makes the writing even more special is in how the comedy perfectly balances out the overall story, delivering clever revelations in plot twists with a twinge of Monty Python. Even the way the game in general pushes forward is so cleanly paced that when the moment finally does happen, it feels like drawing the Master Sword from its pedestal for the first time again. During your quest, your character upgrades his moveset to suit the challenges that lie ahead. While upgradeable skills are part and parcel for this sort of game, it’s the way that you hone them that keeps the difficulty curve riding at a balanced crescent. As a result, your acquired tools work together like the Waltons with an input response time that feels tighter than Scrooge’s wallet. One useful move, in particular, is the ability to perform a second jump after swiping your blade into a lantern. Eventually, the same effect is caused when hitting an enemy as well as their projectiles. This not only allows you to land a string of attacks towards multiple foes and objects while staying airborne, it also works as an effective tool for navigation. When compiled together with your other abilities you have a top-tier platforming experience that will gradually push your ninja skills to the limit. If you have seen The Messenger in action then you will have certainly got wind of its unique eye-catching mechanic. It’s a feature implemented in ways that not only fills the game with even more personality that it already has, but takes everything that you think you know and completely turns it on its head. It’s not unusual for indie games to contain their own spin on providing an interesting slant in gameplay. The Messenger, on the other hand, takes its own traits and builds upon them with an experience that goes above and beyond anything I ever expected from the genre. Other than maybe wanting a bit more variety from standard enemies, I really found it hard to find many faults during my more than 15-hour playthrough. The bosses are aplenty and a lot of fun to fight, the graphics and sound are astounding in a wonderfully nostalgic way, and the gameplay is so fiendishly addictive that I struggled to leave it alone like a sore tooth. I must’ve died over 400 times yet never once did I feel out of my depth. I could see myself getting better the more that I played, which encouraged me to press on to gather those extra collectables. The only real problem that I found had nothing to do with the game itself, but rather the marketing that understandably forced the developer to show some of their cards. Even though the reveal never deterred the joy that I experienced when finally hitting certain landmarks, to have had no clue in what was in store would have completely blown my mind. The Messenger is a prime example of how to study the fundamental rules of a genre that has been replicated a million times before. To then follow these rules, bend them and eventually break them into something of its own calibre of quality is something quite special indeed. In my experience, very few games set with a nostalgic sheen have ever truely captured my childhood quite the same way that The Messenger has. The balance of visuals and sounds drive this feeling further by never seeming like they’re ever overdone or underused. I know at this point that I’ve laid on the butter more than enough to express my adoration for this superb indie title. Yet it’s so impossibly hard not to after spending so many hours grinning like a Cheshire cat while playing it.